LANSDALE, PA — Jason Juranis is no stranger to hard work. His stepfather, a former marine who served in Vietnam, was a taskmaster who demanded perfection. "If you missed a blade of grass while cutting the lawn, he made you go over the whole yard again," says Juranis. After high school, his work ethic and sense of discipline served him well as a Fire Direction Control Specialist in the Army, but five years afterwards, his transition to civilian life proved difficult. "My skills weren't needed outside of the military, and I didn't know what to do with my life," he says. Juranis flitted from one job to another before studying graphic arts at the Art Institute of Philadelphia, where he compiled a portfolio of designs that would eventually inspire the apparel-printing business he founded in 2013 called Warrior Culture Gear, so-named for his love of folklore and Greek mythology. After art school he landed a fulltime design job at a beer company, followed by design work for various companies and print shops. While working as a marketing manager for a firearms manufacturer, Juranis decided to try his hand at designing and selling T-shirts based on his design expertise and experience. "I put up a website, and the first week received orders for 300 pieces." Juranis immediately realized he was in over his head. "I had no clue what to do," he recalls. "I was working a full-time job during the day, having someone else print the shirts for us, and then coming home in the evening and shipping everything as best I could." A year later, he quit his job to focus on his T-shirt business full-time. "The prices I was being charged to print shirts were exorbitant," he says, "and I started thinking this was something I could do in-house." 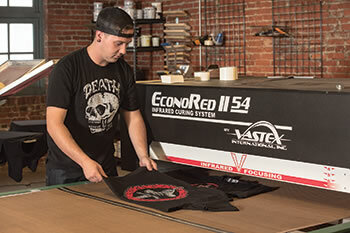 An internet search led him to Vastex where he attended "Screen Printing A to Z," a three-day, hands-on screen printing training class that covered the entire screen printing process. After the course, Juranis was hooked. 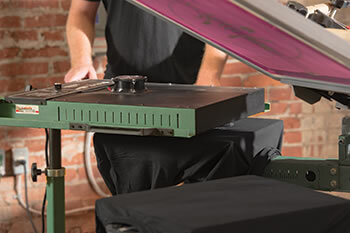 He immediately purchased a manual press and conveyor dryer, and the prepress equipment necessary to start printing T-shirts himself. 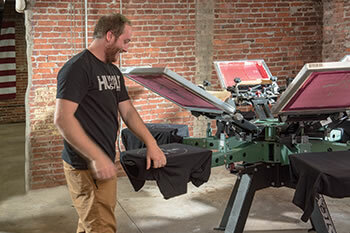 Juranis admits that starting a business with no prior screen printing experience was difficult, but his do-or-die attitude worked in his favor. "There were times I'd think 'what did I get myself into?'" he recalls. "But when I set a goal, I do whatever it takes to achieve that goal. That comes specifically from my military experience." After the equipment was up and running, Juranis spent 12 to 14 hours a day learning how everything worked together. "We made mistakes," he admits. "But eventually we learned a lot of tips and tricks and, combined with the basic training, started to feel very comfortable operating the machines." Juranis purchased the Vastex V-2000 HD six-color, six-station manual press and a VRS pin registration system, which allows him to register film positives with the screens off press and then position the screens on the press with all colors in register. "We use the registration system mostly for four- and five-color jobs," he says. "If they didn't line up consistently, the whole batch would be a disaster, so this ensures that everything comes out perfectly." 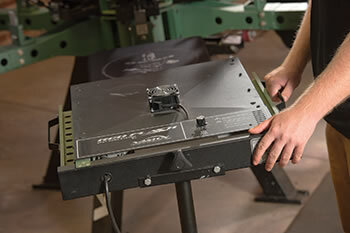 The micro-registration system of the press allows fine-tuning of multicolor registration. He says he is "able to line up the screens in a precise fashion. Even if it's a millimeter off, all you have to do is turn the knob a tad, and it's right back on registration." When printing multicolor jobs, Juranis cures colors using a RedFlash flash cure unit with adjustable heat control. The unit also flashes garments in between two applications of the same color, thereby achieving a more vibrant look. "The flash cure unit is one of those machines that is invaluable to what we do," he says. 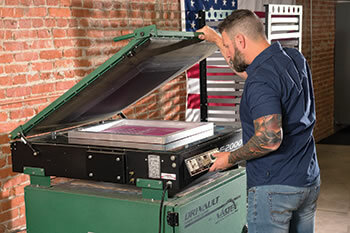 "Speed and accuracy are important to us, and this machine heats up instantly and has proven reliable so we can set it and forget it." 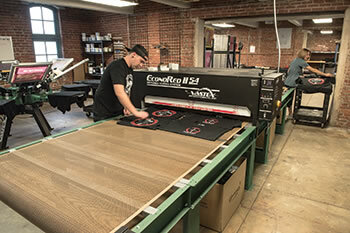 To accommodate his growing business, Juranis moved into a 6,000 sq ft (552 sq m) warehouse and invested in a second V-2000 HD six-color, six-station press. While the two presses are capable of printing in excess of 500 pieces an hour when running simultaneously, Juranis prints approximately 400 to 600 pieces a week due to the intricate nature of his designs. "We prefer to take our time and focus on quality," he says. "Many of our designs have three-plus colors on the front as well as the back, and some even have sleeve prints. We also print the interior of the collar for custom tagging. So the work requires multiple screen and color changes." To improve the work flow from the two presses and in anticipating future growth, Juranis added two 18 in. (46 cm) extensions to the belt of his EconoRed II-54 infrared conveyor dryer. "Expanding the machine was the easiest thing we could have done," he says. "All we had to do was add two new rollers, pull the belt back over them, and we were up to speed." "We come in, turn it on, and in three to four minutes it's at 850 degrees," says Juranis. "The accuracy of that temperature is such that we don't have to worry about the shirts coming out too hot because a cooling bed cools them as they exit the dryer." Juranis also plans to add another heating chamber to the II-54 and purchase a BigRed™ V54 conveyor dryer, with 54 in. (137 cm) wide belt, to accommodate the addition of an automatic press in the near future. "We're opening up the shop to outside printing, so we're looking to double or triple print capacity, depending on orders," he says. To achieve the level of detail found in his artwork, Juranis uses an E-2000 LED screen exposing unit, which sits atop a Dri-Vault™ screen drying cabinet. 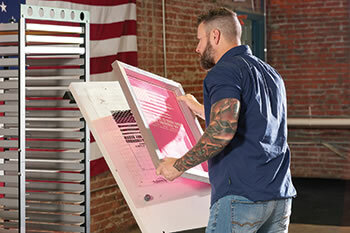 The cabinet holds 10 screens and with its 200 cfm air flow blower dries them in approximately 20 minutes. With the purchase of the automatic press, Juranis plans to upgrade to a larger cabinet that can hold 24 screens to keep up with the production increase. The dried screens are then transferred to the screen exposure unit, which can expose a screen in as little as three minutes. A vacuum hold-down produces a tight screen-to-film contact, resulting in high resolution half-tones and crisp details. Juranis says, "We're able to get the fine-line detail that sets us apart from our competitors." His intricate art coupled with motivational quotes have attracted a following among veterans and military personnel, but his messages also resonate with a growing number of civilians. 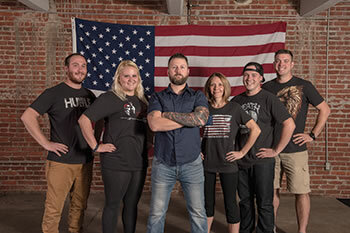 "I started Warrior Culture Gear so kids who've experienced the horror of war could connect with like-minded people, but I don't want to be pigeonholed as a military brand," he says. "Every culture has a warrior class, and it has nothing to do with the military specifically. Even the child who's battling cancer is a warrior in my book; he's fighting a battle that no one else understands. So if I can help people feel better about their situation, then I've achieved my goal." PIN registration system registers film positives with screens off-press; screens go on-press with all colors in register, eliminating the time and rejects associated with trial-and-error methods. Warrior Culture Gear's E-2000 LED unit exposes the screen in several minutes while yielding fine line-detail. 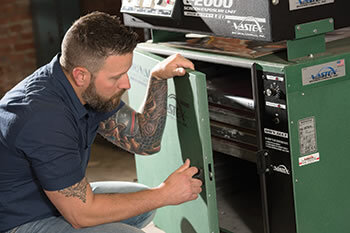 Dri-Vault™ screen drying cabinet dries screens in approximately 20 minutes using heated and filtered airflow. 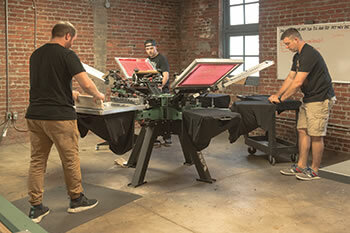 Matthew, Kenneth and John turn out T-shirts on the V-2000 HD six-color, six-station manual press. Warrior Culture Gear's RedFlash unit cures between successive colors and/or double hits of the same color. To improve work flow, Warrior Culture Gear added two 18 in. (46cm) belt extensions to its EconoRed II-54 infrared conveyor dryer. Warrior Culture Gear team: (L-R) Matthew McGrath, Meghan Heger, Jason Jurainis, Cara Martin, Kenneth Marren, John Ferguson.